Object 279 Kontin was born out of the Soviet desire for a heavy tank that could indirectly withstand a nuclear blast and fight in a radioactive wasteland as well as cross terrain considered inaccessible for conventional armor and act as a heavy breakthrough tank. These tanks were supposed to be used only by the Supreme Command Reserve (used for breakthroughs and for last ditch defense.) Designed in the mid 50s at the Kirov plant and two prototypes were delivered in 1959. It weighed 60 metric tons which was almost double the weight of the then latest Soviet main battle tank, the T-62 which weighed in at 37 metric tons. For comparison's sake, the current M1A2 model with depleted uranium armor weighs in at around 65 metric tons. The tank hull, with a maximum armour thickness of 269 mm, was covered by a thin, elliptical shield protecting it against APDS and shaped charge ammunition, and preventing it from overturning by the shockwave in case of a nuclear explosion. It comprised large cast irregular shape structures of variable thickness and slope. The all-cast front part of the hull was rounded in shape with thin armour panels against HEAT projectiles, which ran around the edges of the front and sides of the hull. The sides of the hull were also cast and had similar protective armour panels. The all-cast turret, with a maximum armor thickness of 319 mm, was rounded and had anti-HEAT protective panels. The turret ring was also heavily protected. The tank was equipped with a chemical, biological, radiological, and nuclear (CBRN) protection. The gun was provided with a semi-automatic loading system with a rate of fire of 5-7 rounds/min. Firing control system comprised optical rangefinder, auto-guidance system and L2 night-sight with an active infrared searchlight. The tank was cancelled because of Nikita Khrushchev who preferred lighter, faster and easier to produce tanks such as the T-62 and the IT-1 missile armed tank which (like its Western counterparts) proved to be a dud. Also playing a factor in the cancellation was the realization that the complexity of the tank with its quad track design would be a headache to maintain, its low maneuverability and the fact that it was too heavy to be used on most Soviet bridges. It consists of 1567(!!!) 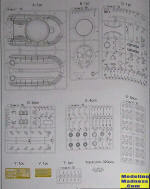 parts including PE. Before you freak out (I did till I figured it out), many of those parts are for the tracks and there are quite a few considering there are four of them—the tracks come in one small bag and the linkage pins are attached on their own sprue. The parts are well detailed and there is an injection mark on each link so one could be really busy sanding them off. On the bright side, it comes with a jig to help assemble the tracks. 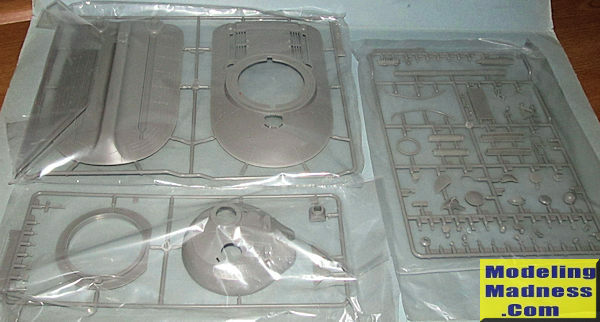 There are two spures for the running gear, four sprues for the road wheels, one sprue for the turret hull, one sprue for the weapons and various protrusions, one giant sprue for the hull, one sprue of clear plastic, five sprues for the linkage pins, and one bag of track links. 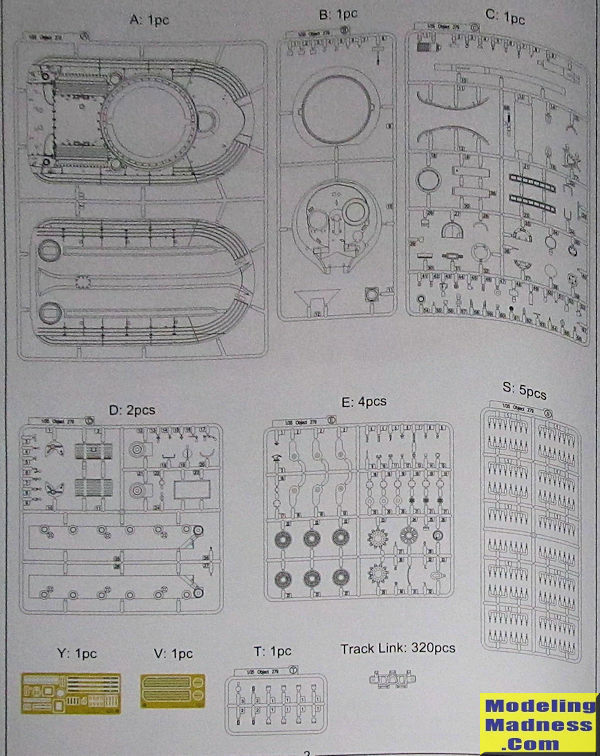 Also included are two sheets of PE for the engine grills and various small parts and one copper wire for the tow cable(?) No interior is supplied which is fine with me as I don't usually build armor interiors. It looks like it is going to be an interesting build. Not going to be an easy build thanks to some 400 links and link pins. 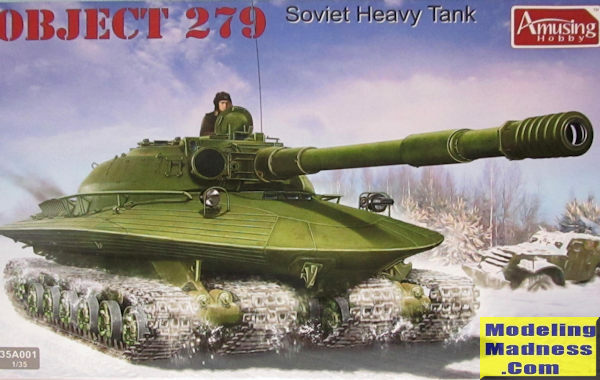 This Cold War model joins the increasing ranks of prototype tanks that are suddenly appearing on the shelves. Three different model companies have put out a model of this odd ball of history within a year (2013). Prior to that there were zero injection plastic models of this beast.